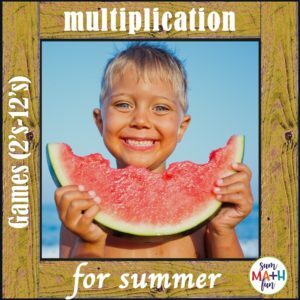 Multiplication Games – Division Games – 3rd & 4th Grades – 26 Activities Bundled! 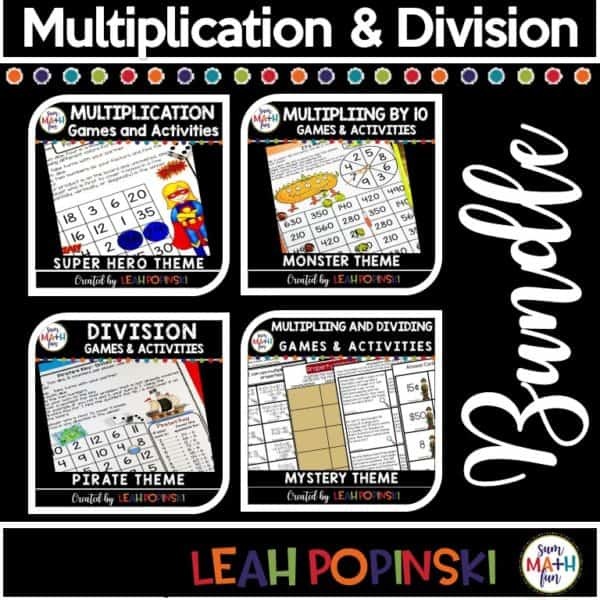 This JAM PACKED Multiplication and Division bundle has 157 pages filled with 26 different multiplication and division games and activities that develop understandings and fact fluency! The bundle includes a variety of approaches to learning multiplication and division, using multiple visual supports and formats to engage a wide variety of learners. ✎ There are games for concepts, facts, review, and practice + posters for Essential Questions, Enduring Understandings, and I Can Statements. Detailed teacher notes, tips, and ideas are included, too! ◼️ Shazam! – This center can be used as a matching or memory game. 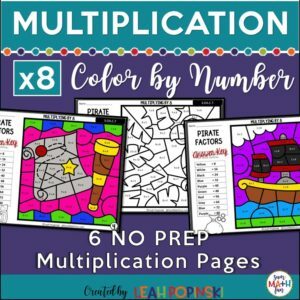 Repeated addition cards are matched to their multiplication equation to help students develop the concept of multiplication. Shazam! If you match them all correctly! ◼️ Up, Up, and Away! – This can be a matching or memory game. Cards with equal group visuals are matched to their multiplication equation to show multiplication as the concept of equal groups. ◼️ KA-POW! This is a student favorite! Students practice their 1-6 times tables by rolling dice and covering the product on their game board. The first student to get four-in-a-row wins! ◼️ Power Arrays – Array pictures are matched to their corresponding multiplication facts to build the concept of multiplication. ◼️ It’s a Problem! – These one-step word problems are super engaging. Students match the word problem to the equation that will solve it. The answers are given so they only need to focus on the meaning of the word problem! ◼️ BOOM! BANG! – Another student favorite! Students practice their 3 times tables by spinning the spinner on the game board and covering the product. The first student to get four-in-a-row wins! ◼️ BAM! – This game focuses on practicing the harder facts of 7s, 8s, and 9s. Students roll a die and move around the gameboard finding products. They cover a Super Kid that has that product. The player to cover the last Super Kid is the winner. But…watch out for BAM! ◼️ Build a Super Kid – This is a puzzle that works great as an individual activity for students who need some quiet time. Students match facts to their products to complete 4 Super Kids. ◼️ Monster-ply – This is a matching or memory game. Students match equations with factors of 10, 20, 30, 40, or 50 to their products to practice multiplying by multiples of 10. Students record their answers on the included answer sheet. ◼️ Eye-Can-Multiply! – This fun game is played the same as the one above but focuses on the multiples of 50, 60, 70, 70, and 90. Students record their answers on the included answer sheet. 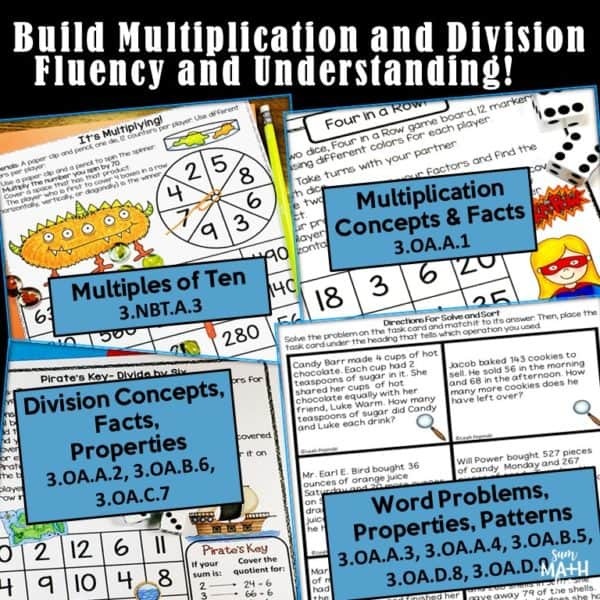 These games are great for practicing facts as well as the strategy of multiplying by 10! ◼️ Monster-Tack-Toe – This is always a favorite! It’s a version of the old Tic-Tac-Toe board game but with a twist! Students choose one of two game boards. They take turns spinning the included spinner and multiply the number they spin by 20. If that number is uncovered on their game board, they cover it. The winner is the first to get three in a row covered. ◼️ Monster Lab – This is a variation of four-in-a-row. Students take turns rolling one die. They multiply the number they roll by 60 and cover it on the game board. The first player to cover four-in-a-row is the winner! ◼️ It’s Multiplying! – Another favorite four-in-a-row game! This one uses an included spinner. Students multiply the number they spin by 70. This is such great practice! They really must know their 7 times tables! ◼️ Monster Mash – They love this game and the name! This gives students practice with mixed multiples of 10. They roll a die and move that number of spaces. They Mash (cover) the Monster on the game board with that answer. If they land on “SPLAT”, they can choose any monster to Mash! The player to mash the last monster is the winner! ◼️ Shiver-me-Timbers – In this matching game, students find how many groups of a given number they can make using the pictured items. Fun practice for sharing equally into groups! After matching all the cards, students record their answers on a recording sheet. ◼️ Gang Plank Grouping – This is a great follow up to the above game. In this version, students use visual representations to model division. After matching all the cards, students record their answers on a recording sheet. ◼️ Skull and Bones Subtraction – Students have cards with visuals of repeated subtraction models to match to its division equation. After matching all the cards, students record their answers on a recording sheet. ◼️ Related Riches! – In this game, the focus is the relationship between multiplication and division. Students think of division as a missing factor problem. After matching all the cards, students record their answers on a recording sheet. ◼️ Ship Wrecked Six – A favorite division game! Students roll two dice and add the number together. They look at the Pirate’s Key and find their sum to see what division problem with a divisor of 6 they answer. Then they cover that number on the game board. The first player to cover four boxes in a row is the winner! ◼️ Steal It Seven – Like Ship Wrecked Six, the kids love this one! They spin a spinner on the gameboard and divide the number they spin by 7. They cover a space on the gameboard that has that quotient. To win, they must be the first one to cover four-in-a-row! ◼️ Aye-Aye Eight! – And yet another fun game board one played like four-in-a-row! For this one though, they Divide the number they spin by 8 and cover a space that has that quotient. ◼️ Navigating Nines! – Students roll two dice and add the number together. They look at the Pirate’s Key and find their sum to see what division problem with a divisor of 9 they answer. Then they cover that number on the game board. The first player to cover four boxes in a row is the winner! 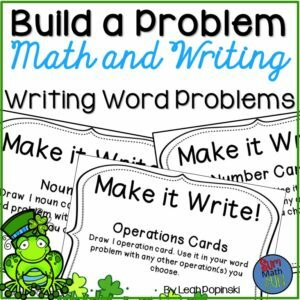 ◼️ Sniffing Out Word Problems – This center is wonderful for assessing who really understands multiplication and division! Students select an equation card and write a word problem to match. They also draw a picture of their problems. The unknown is in all different positions so students get real practice in using all the multiplication and division strategies they’ve been practicing! ◼️ Missing Numbers – Students match missing number in equations. The “missing numbers”, a.k.a. unknowns are in all different positions within the equations. ◼️ Just the Facts! – This center is a sort of the commutative, distributive, and associative properties of multiplication. Students sort cards with problems solved using one of the properties into groups. ◼️ Solve and Sort – For this fun center, students solve the word problem on a task card and match it to its answer. Then, place the task card under the heading that tells which operation they used. ◼️ Find the Rule! – What’s the rule?? Using tables with multiplication and division patterns and relationships, students match a rule to a table. 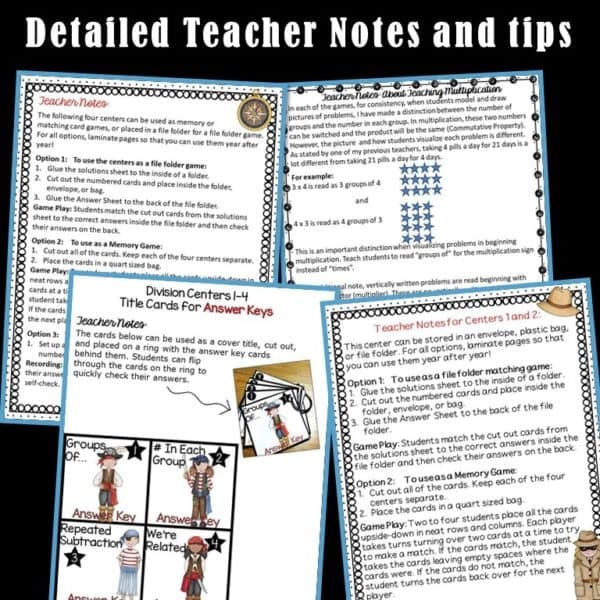 ◼️ Detailed teacher notes, tips, and ideas also included! ❤️ Great for homeschooling families too! ❤️ Just print, laminate or use sheet protectors, and use year after year! ✅ Early Finishers and Gifted Activities-Homework & Extensions – Bundled! 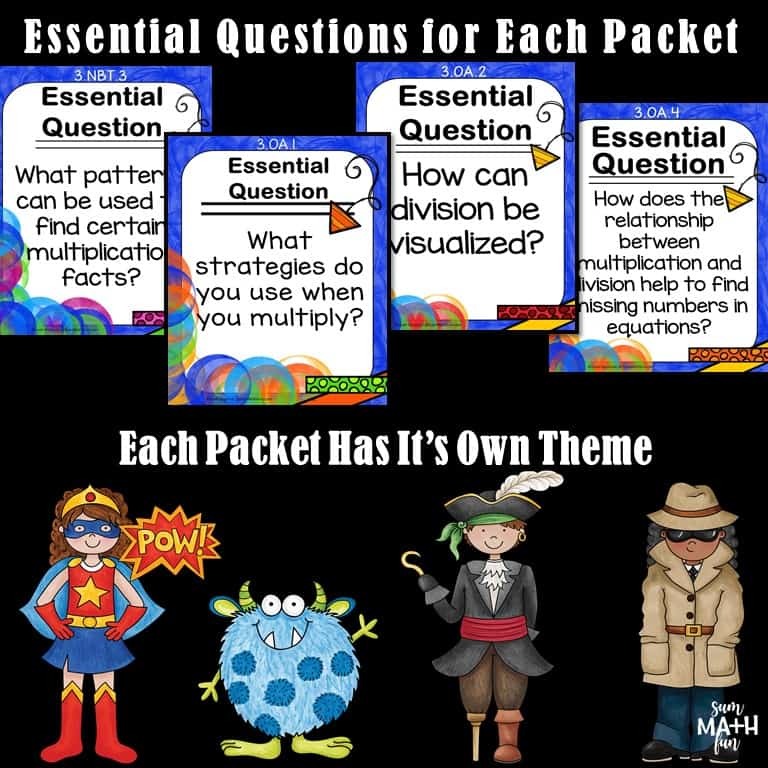 ✅ Word Problems 3rd Grade Multi-Step Common Core Aligned – Bundled! See the preview for a detailed look inside!